The date for my sliding lid candle box class has been set and registration has been opened. We’ll be making the box from pine to save on material costs and to make the joinery a bit more forgiving for novice makers. Here are the details for the class. The sliding lid candle box in cherry. We will build a similar box from pine in the class, either wall hanging like this one, or table top if you’d prefer. The choice will be up to you. Learn to hand-cut dovetail joints and make raised panels by building a sliding lid candle box, based upon an antique from the 18th century. You’ll learn to lay out and make half blind and through dovetail joints with a handsaw and chisel. 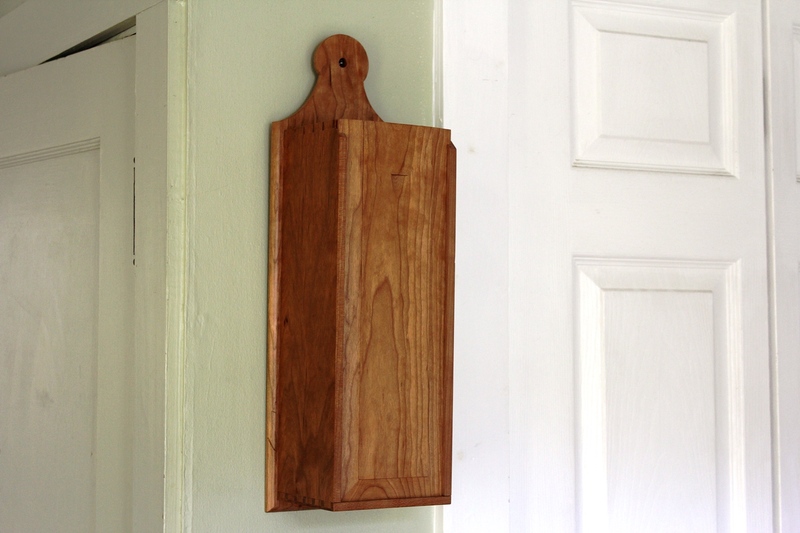 You’ll create a raised panel lid with a hand plane, and learn to use cut nails to attach the back. To register for this class, visit the Chestnut Creek School of the Arts class registration page. Posted in Classes, News & Updates and tagged sliding lid candle box.